Sanvaro, bay Oldenburger Stallion by (Sandro Boy / Quilara [Calvaro]), born in 2004, standing approximately 17 hands. This son of the world cup winning Sandro Boy is showing tremendous scope. Sanvaro is out of the mare Quilara, who competed at the World championships in Lanaken ridden by Alois Pollmann-Schweckhorst. 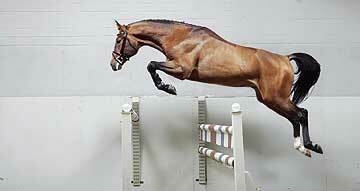 Sanvaro`s pedigree is almost saturated with internationally successful jumping genes. The dam’s sire Calvaro was victorious over the world’s most challenging courses under three different top riders: Dr. Michael Rüping, Jos Lansink and Michael Whitaker. He participated in the Olympics and has produced a number of top class horses in the international circuit such as Castle Forbes Cadeau/Jessica Kürten. Her grandsire Quick Star was himself a star with Meredith Michaels-Beerbaum in the saddle and is responsible for numerous top-horses such as S.I.E.C. Royal Start/Cameron Hanley. The lifetime earnings of Quick Star’s offspring exceed € 600,000. The icing on the pedigree-cake is the dam Quilara – she was sold via the PSI auction for € 400,000. Sanvaro is going to live up to the genetically predestined expectations in his outstanding jumping talent.